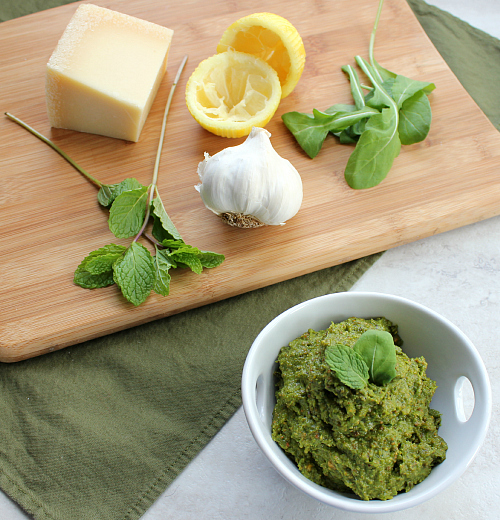 i absolutely love all types of pesto, from simple and traditional basil pesto to fancy sun dried tomato pesto with toasted almonds and italian parsley. you just can't beat it. it's so delicious and so versatile. you can put it on pasta, chicken, sea food, grilled meat, sandwiches, pizza . . . just about anything. 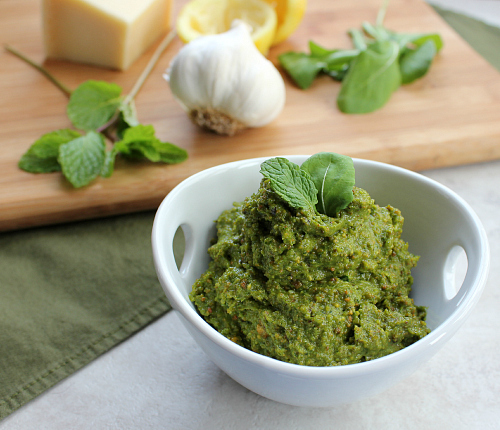 arugula, mint, and pistachios are some of my favorite things, so i was really excited when i found a pesto recipe that combined all three of these ingredients. the flavor of this pesto is just out of this world. the arugula and mint make it bright and bold, and the pistachios give it a nice nutty balance. it has a great underlying garlic flavor too. this pesto is now one of my new favorite recipes. a winner for sure! when i made this recipe, i used half right away and froze the other half to save for later. 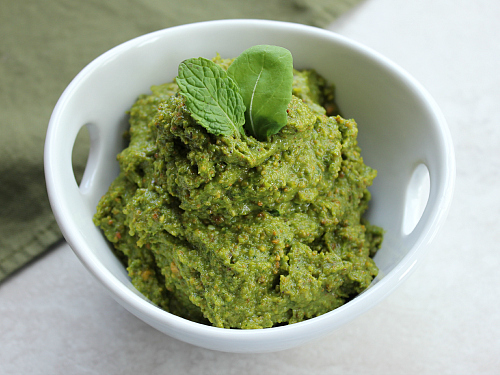 it's so nice to have some frozen pesto on hand to use at another time. we put it on some pasta and it was so delicious. i can't wait to put it on other things too. i'm thinking it would be great between two slices of nice bread with some fresh mozzarella and tomatoes. yum! 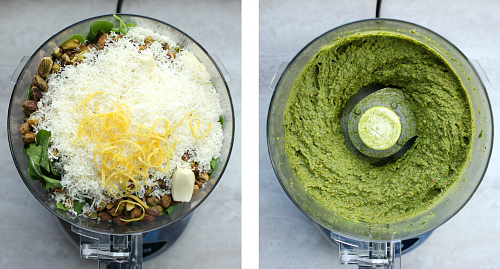 in a food processor, combine the arugula, mint, pistachios, garlic, cheese, and lemon zest. pulse until everything is well pureed. scrap down the sides of the bowl as needed. with the food processor running, gradually pour the lemon juice and the olive oil into the mixture in a steady stream. blend together until smooth.